James Hibbard holds Licentiate and Fellow Diplomas from Trinity College, London England. He studied with Reginald Bedford and has participated in masterclasses given by Nadia Strycek in Quebec, and Norman Shetler, Balint Vazsonyi and John Ogdon at the Institute for Advanced Musical Studies in Switzerland. He is director of music at Calvary United Church in London. Recently he performed all the Chopin Etudes in Oregon, U.S. and at Western on both modern and period pianos. 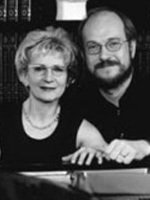 James and his wife Tina Yanchus perform as the Yanchus-Hibbard piano duo. They have been heard several times on CBC Radio’s Mostly Music and Arts National. They also have performed and coached chamber music together for 11 years at the Kincardine Summer Music Festival. They currently teach at Western University’s Don Wright Faculty of Music, and are both much in demand as music festival adjudicators. They have maintained a large class of piano students for more than 40 years.